The Qutb Minar complex in Delhi is one of India’s top attractions, sometimes outdrawing the Taj Mahal. Visitors marvel at the tallest all-brick tower in the world, completed almost 650 years ago, and at an unpainted iron pillar that has not rusted for almost 1700 years. The Qutb Minar complex is named for Qutb al-Din Aybak, a slave turned general from Afghanistan who conquered northern India in 1192, destroying at least 27 Hindu and Jain temples in the process. In 1206, Qutb al-Din Aybak declared himself Sultan of Delhi and began building a brick victory tower incorporating rubble from the demolished temples. When he fell from his polo horse and died in 1210, his successors continued his work. The fluted sandstone tower, adorned with statements from the Quran, was topped off in 1368 at a height of 238 feet, about 50 feet higher than the contemporaneously constructed tower in Pisa, Italy. 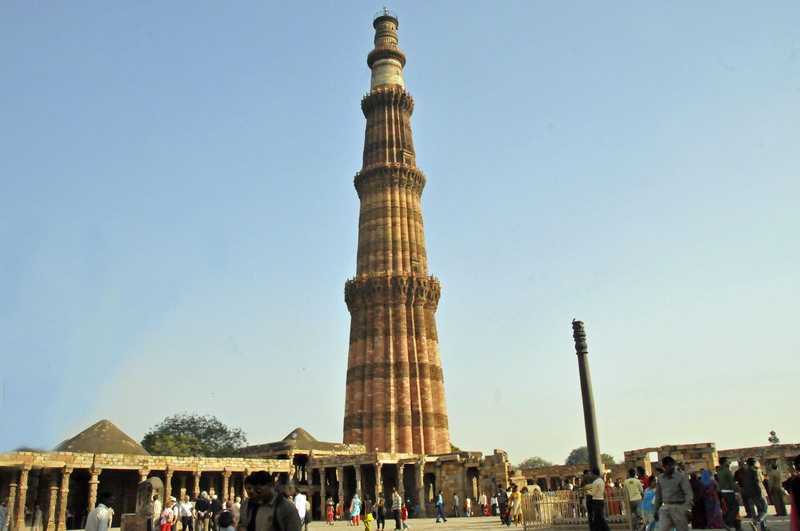 With 379 internal steps and five circular balconies, Qutb Minar has become a symbol of Delhi. As the Muslim conquerors under Qutb al-Din Aybak demolished the temples at the site on which they later built Qutb Minar, they intentionally spared a 22-feet tall iron pillar erected in the fourth century to honor Vishnu, a Hindu god. They spared the 16.4-inch diameter pillar because of its apparently magical ability to resist rust, a property scientists now attribute to phosphorus added by Hindu metallurgists. So unusual is a rust-free iron pillar that people still believe their wishes will be granted if they can encircle the pillar with their arms stretched behind their backs. A fence now protects the pillar from pilgrims seeking to improve their luck. 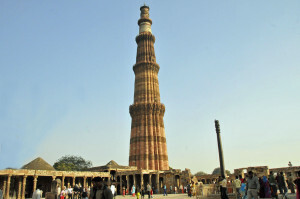 The beauty and continued existence of Qutb Minar are tributes to its Muslim designers. The nearby iron pillar reflects the genius of Hindu metallurgists. A visit to the Qutb Minar complex therefore reminds us that many cultures have produced works of lasting importance. A visit also provides an opportunity to bemoan the need members of religious traditions unfortunately still have to try to show the superiority of their faiths by destroying the holy places of those with different beliefs.